Abstract. Models of landscape evolution provide insight into the geomorphic history of specific field areas, create testable predictions of landform development, demonstrate the consequences of current geomorphic process theory, and spark imagination through hypothetical scenarios. While the last 4 decades have brought the proliferation of many alternative formulations for the redistribution of mass by Earth surface processes, relatively few studies have systematically compared and tested these alternative equations. We present a new Python package, terrainbento 1.0, that enables multi-model comparison, sensitivity analysis, and calibration of Earth surface process models. Terrainbento provides a set of 28 model programs that implement alternative transport laws related to four process elements: hillslope processes, surface-water hydrology, erosion by flowing water, and material properties. The 28 model programs are a systematic subset of the 2048 possible numerical models associated with 11 binary choices. Each binary choice is related to one of these four elements – for example, the use of linear or nonlinear hillslope diffusion. Terrainbento is an extensible framework: base classes that treat the elements common to all numerical models (such as input/output and boundary conditions) make it possible to create a new numerical model without reinventing these common methods. Terrainbento is built on top of the Landlab framework such that new Landlab components directly support the creation of new terrainbento model programs. Terrainbento is fully documented, has 100 % unit test coverage including numerical comparison with analytical solutions for process models, and continuous integration testing. We support future users and developers with introductory Jupyter notebooks and a template for creating new terrainbento model programs. In this paper, we describe the package structure, process theory, and software implementation of terrainbento. 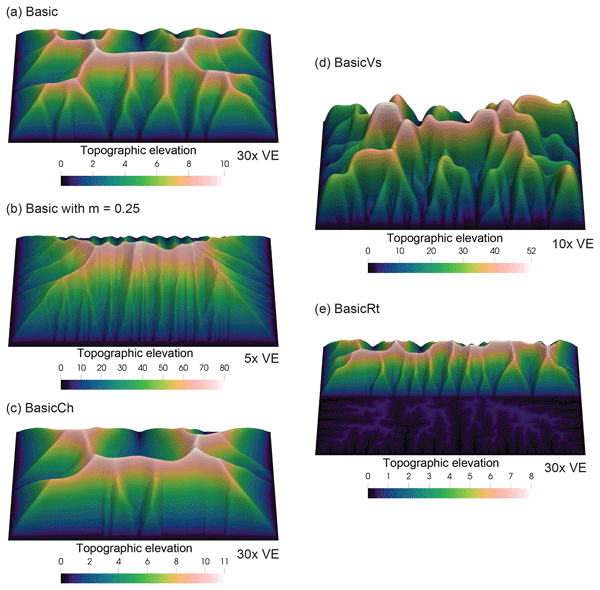 Finally, we illustrate the utility of terrainbento with a benchmark example highlighting the differences in steady-state topography between five different numerical models. 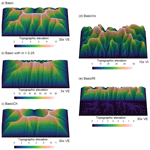 How to cite: Barnhart, K. R., Glade, R. C., Shobe, C. M., and Tucker, G. E.: Terrainbento 1.0: a Python package for multi-model analysis in long-term drainage basin evolution, Geosci. Model Dev., 12, 1267-1297, https://doi.org/10.5194/gmd-12-1267-2019, 2019.